Sixteen schools will compete for places in this season’s quarter-finals of the Ulster Schools’ Cup on Saturday morning. Holders Campbell College open with a tricky start away to Sullivan Upper. Enniskillen Royal Grammar School will play Down High School in the 4th Round of the Danske Bank Ulster Schools’ Cup. This will be the first Ulster Schools’ Cup game for Enniskillen team while Down team will be on the road, once again, for their third Cup game this season. Enniskillen is essentially a young squad featuring some ten Year 12 players as regular starters. Team captain, Alex Parke, who is also Head Boy in the school, has led his young charges to 13 victories this season and will be looking for a 14th victory this weeken. Alex gets great support, on and off the pitch, from his scrum half, Matthew McConkey, who is the Deputy Head Boy. Eddie Keys, son of forwards coach, Alistair, has been central to the success of the team this season with his ability to score tries as well as kick points. Callum Smyton is a hardworking back row forward whose explosive play has seen him top the try scoring list for his season and he will be only too pleased to add to his impressive total against Down High. Callum, along with Justin White, was part of the Ulster U17 Schools’ squad earlier in the season. They will see this game as an opportunity to push for further representative honours. Likewise, players such as David Stinson, Stuart Brown and Alex Parke have been part of Ulster Regional Development Squads and will wish to push on to be included in the Ulster Schools’ Age Grade representative squads later in the season. Andrew and Harry Dane are twin brothers who are vital members of the Enniskillen Royal Grammar School pack while Eddie Keys can look to his twin brother, Henry, a back row forward, to provide him with some protection at critical times in the game. Alex Parke forms a formidable centre partnership with Robbie Mills who is an Irish Rowing Champion. Down High School is on the road once again and having overcome the challenges provided by Carrickfergus Grammar School in the 2nd Round and Omagh Academy in the 3rd Round. Not many schools travel to Omagh, at any stage of the season, and come away with a victory. That is exactly what the Down High School team did back in September and then they repeated that with another win in the 3rd Round of the Schools’ Cup. Those wins will have given the squad a great deal of confidence as they prepare to travel to Enniskillen. The team is captained by their hard-working open-side flanker, Reece Hagan, a player who leads by example, both on and off the pitch. His workrate in the game against Omagh Academy was outstanding. The workload of vice-captain is shared between Greg Hutley and Charlie Marshall. Both these players offer great support to Reece and are regularly among the points scorers for Down High as they showed in the second round against Carrickfergus Grammar School and the third round against Omagh Academy. Greg, an Ulster U18 Schools’ and U19 player, is the leading points scorer for the team. He can play effectively as an outhalf or centre and is a very fine striker of the ball out of hand or off the tee. Greg has had his talents recognised from further afield and he was a recent attendee at an Ireland Age Grade Camp. Charlie is a very hard-working No 8 who has scored quite a number of tries this season following dynamic plays from the base of the scrum. 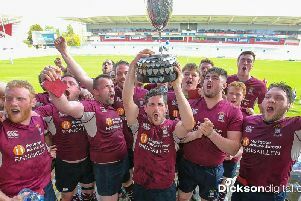 Royal Belfast Academical Institution has struggled at times this season due, in no small part, to the extensive injury list the squad has had to endure. However, recent positive results would suggest that the squad is starting to hit some form at just the right time. Captained by Angus Adair who has, unfortunately, missed quite a few games due to an injury, it will be seen as a major boost to the hopes of his squad if Angus is able to make it back for this tie. Robin McIlveen, an Ulster Schools’ U18 Centre, is an exceptional player with pace, great defence and the vision to read the game well. A natural leader, Robin has been filling in as captain in the absence of Adair. Robin is also the team’s goal kicker and the leading the points scorer this season. Jude Postlethwaite is an Ulster Schools’ U18 winger who has recently moved into the inside centre position for his team. He is an extremely athletic individual who is dangerous with ball in hand. Over the years Royal School, Dungannon teams have built up a reputation of being hard to beat at home in the Ulster Schools’ Cup. That reputation is well deserved and the nteam received a boost after defeating Larne Grammar in the third round. The team is captained by Luke McMullan, a young full back who had his considerable talents recognised when he was selected as a schoolboy player on the Ulster U18 Club team back in August. Luke captains a squad of players that is a mixture of youth and experience. There are players such as Jack Girvan, another Ulster U18 Clubs’ player, who have the ability to bring flair to the performance of the team. Luke Connelly and Jordan Redmond form a strong ball carrying centre partnership and they have created the space for other team mates to finish their hard work off with tries. Royal School, Armagh host Bangor Grammar School in what is bound to be a day of mixed emotions for Kenny Hooks, one of the Armagh coaches and one of the most respected coaches involved with the schools’ game in the Province. Kenny played on a very successful Ulster Schools’ Cup winning Bangor Grammar School team a number of years ago and then went on to coach Armagh to Ulster Schools’ Cup success in 2004. Aaron Woods leads his team from the back row and has seen his teammates put in some great performances in the course of the current season. However, there is a feeling in the camp that there is a deal more to be done to improve consistency in the performances and an overall improvement in results. Bangor team has had a mixed season in terms of results so far having won seven out of 18 games played. However, there is a feeling around the Bangor Grammar School camp that if they were in a position to select their strongest starting xv then they should be able to make a few teams sit up and take notice. In Aaron Sexton Bangor has a prodigious talent and a young man who handles all his accolades in a very modest manner. He has played for the Ulster team in a pre-season friendly, starred for the Ulster ‘A’ team in their Celtic Cup games and played with the Ireland U19 team earlier in the season. The squad has a good mix of Year 13 and Year 14 players this season all of whom have experience of the Schools’ Cup campaign from last season. Sullivan Upper School will play near neighbours Campbell College in the 4th Round. Sullivan Upper has recorded some impressive results this season including a victory against Campbell College earlier in the season. Taking that result into account might see Sullivan Upper entering this game against the current Cup holders as slight favourites. Adam Craig leads a coaching team at Sullivan Upper that includes David Armstrong, Chris Henderson, Mark Henderson, Paddy McGrattan and former pupil, Ross Adair. The team is captained by their 2nd Row forward, Jamie Thallon, a player who has only missed one 1stxv game in the last three seasons. Holders Campbell College have produced a recent run of very impressive results against renowned schools from Munster and Leinster which would suggest the Belfast team is not going to give up easily their grip on the famous Ulster Schools’ Cup. The team is captained by Rex Tinsley who brings great leadership qualities to the role. As well as being a very astute centre on the pitch Rex is also Head Boy at Campbell College. He was a member of the Ulster U19 squad that defeated the Australian Schools’ team back in December and players such as Jack Stinson, Conor Rankin, Paddy McAlpine, Jack Boal, Finlay Parks and Luke Collins have been involved with various Ulster and, in some cases, Ireland Age Grade squads. Cambridge House Grammar School has played two games in the course of their current Schools’ Cup campaign. They defeated Banbridge Academy at home in the 2nd Round before travelling to defeat Lurgan College in the 3rd Round. They now host Wallace High School, one of the favourites to win the competition and the players will be fully aware that a win in this game will put them into the draw with the last eight of the competition. Cambridge House is captained by Kane McIlroy, a player who was involved with the Ulster U19 squad when they won a blitz competition involving Sale RFC and Newcastle RFC U19 teams at Barnard Castle School back in August. Kane has led his team to good effect this season having played 18 games and winning more than they have lost. Wallace High School has recorded some impressive results this season and boast some very talented players in the squad. They will see themselves as firm favourites to win this game despite having to travel to Cambridge House. Reuben Crothers, an outstanding No 8, is the team captain. Reuben has led his team well throughout what has been a very successful season results wise thus far. Nathan Doak, a very talented scrum half, is the leading point’s scorer on the team this season. Nathan has an eye for the whitewash as well as being a very accurate kicker out of hand and off the tee. Ballymena Academy will be hopeful of maintaining their undefeated record at home this season and, having already beaten Belfast Royal Academy at home earlier in the season in a close game played in dreadful conditions, may be favourites to progress to the quarter finals. Ballymena has experienced coaches at the helm with the dream team of John Andrews and Gavin Murray in charge. Patrick Hargy, as team captain, has led his team well in the course of a season that has seen a lot of re-building going on in the ranks of the squad with only five Year 14 players being regular starters. Belfast Royal Academy will enter this game in a very positive frame of mind. Recent excellent results against some of the leading schools’ teams in the Province would suggest the squad has hit an excellent run of good form at just the right time. The season started with the team winning the Ian H Graham Trophy at the Grosvenor Grammar School Festival. An excellent outing at the Methodist College, Belfast 150th Anniversary Tournament in October saw this talented group of players start to merge as a squad with a great deal of potential. Team captain, Tom Stewart, is a player who seems to be destined to go far in the game. Tom has played with the Ulster Schools’ U18 team, the Ulster U19 team and is figuring highly in the thoughts of the current Ireland Schools’ U18 Management team. Dalriada School will not be overawed in the slightest by the fact that most observers would see the Methodist College, Belfast as favourites to win the Danske Bank Ulster Schools’ Cup this season. Dalriada travelled to play and defeat Coleraine Grammar School in the 3rd Round of competition. They will be delighted to welcome Methodist College to their St James’s Road venue for this intriguing encounter. Dalriada has had a very successful season so far, having won 12 out of 15 games played and these positive results will have generated a great deal of confidence. The team is captained by their out half, Paddy Carson. Paddy has shown great maturity this season in his play and, when under pressure, is someone the team can look to for a calm head and reassurance. His experience from playing representative and Senior League cricket obviously helps him in these pressure situations. He is ably supported by those around him such as Luke Pollock, James McCormick and Peter Wright all of whom have represented Ulster at Age Grade and RDS level. Not for the first time, Methodist College will carry the mantle of favourites to win the competition but their results this season against all-comers from schools in Ulster, Munster and Leinster would suggest the tag as favourites is fully justified. Kevin McNaboe is the team captain who has led his players to great success in the course of the current season. Undefeated in normal game time their successful season has seen victories against the mighty Blackrock College, when the Methody team won the McIntosh Shield, as well as a training camp in Portugal which finished off with a win against a strong Portugal U19 team. The top poin’s scorer for Methody is Ethan McIlroy, a talented player who is equally at home playing as a full back or on the wing. Rainey Endowed School will realise they will have to raise the bar once again when they meet Ballyclare High School. Ulster Schools’ and U19 player, Bryn Davies, is the team captain and Bryn has led his team through to a great deal of success this season. Recent morale boosting victories, especially their 3rd Round victory against Portadown College, as well as a training camp in Portugal prior to Christmas, have put the squad into a very positive frame of mind. There are three sets of brothers playing in the squad this season. Twins, Ryan and Matthew Brown are joined in the Rainey pack by Daniel and Sam Clarke. In the back division, David and Matthew Dripps feature regularly with their try scoring exploits. The vital link between the Rainey forwards and backs is Tim Campbell who is a son of the Rainey coach, Chris Campbell. Jonathan Drennan and Harry Evans top the Rainey points scorers this season with their ability to score tries as well as kick for points. Ballyclare High School will see themselves as clear favourites to win this game as early in the New Year they came from well behind at the interval to record an excellent victory against Rainey. Since then some recent excellent performances have really seen a boost of confidence spread throughout the entire squad. Michael Orchin-McKeever continues in his role as Director of Rugby and 1stxv coach in the school. He continues to receive assistance from Aaron Playfair, Matthew Coulter and Gary Clotworthy with Gareth Lenaghan taking on the responsibilities as Team Manager. The team is captained by Adam Clarke, an outstanding back row player, who is equally adept playing as an openside flanker or as a lock forward. Adam has two vice-captains supporting him on and off the pitch in Adam Clarke and Matthew McCullough. Mark Jackson is the top points scorer for the Ballyclare High School team with Matthew McCullough the top try scorer. These two players, alongside Ewan Wasson, James Logan, Josh Cowan and Stuart Hull in the Ballyclare back division have been regular try scorers throughout the season and the Rainey defence will need to monitor them closely. Forwards such as Robert Reid, Jack Gamble, Adam Barron, Brian Weatherup, Taylor Mitchell, Adam Campbell, Callum Mc Connell and David McCleary, who is also Head Boy in the school, are encouraged to provide first class set piece ball as well as quick phase possession so that the talented Ballyclare back division can launch attacks from all areas of the pitch. The ability the Ballyclare team has to do so was demonstrated clearly on a number of occasions against the Friends’ School in the previous round. Adam Campbell was involved with the Ulster U19 squad earlier in the season while Jack Gamble, Robert Reid and Mark Jackson were involved at Ulster U18 level this season.